Delivers up to +50dB of gain for super amp-pummeling power. The mighty Angry Troll boost pedal serves up monstrous portions of volume and gain to pummel the input of your amp. It adds bite and punch while transforming your anemic and mild mannered tone into a beastly sonic onslaught. The Angry Troll boost pedal's two controls interact like a vintage mic preamp. The Anger knob-a rotary switch with six Fists of Fury positions-adjusts the amount of gain created by the Angry Troll effect pedal's op-amp, while the Volume knob regulates the overall output level. The guitar pedal's high-grade components are used for a precisely tuned circuit that works like an extension of your amp. 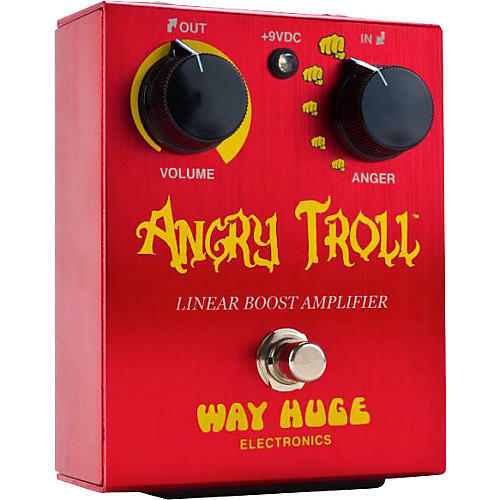 The Way Huge Angry Troll effect pedal can be powered by a single 9V battery or with a Dunlop ECB003 external DC power supply (not included). The power input is a 5.5mm x 2.1mm jack with the positive voltage on the outer sleeve. The Way Huge boost pedal will lock into bypass mode when it is time to change the battery. It also includes power protection circuitry to prevent damage from AC power supplies. Order the top for over-the-top punch. Power supply: Standard 9V battery, Dunlop ECB003 AC Adapter, Dunlop DC Brick, or CAE MC403.